Classic literature goes to candyland in this crazily colorful fever-dream fantasy version of F. Scott Fitzgerald's 1925 novel. 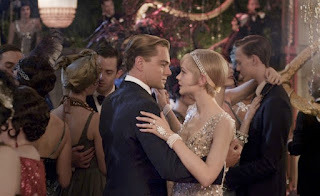 Director Baz Luhrmann has transformed the author's noirishly bitter jazz-age period piece into a brazenly bizarre ADD sugar rush that careens from perfume-ad lushness to music-hall madness to operatic melodrama. It's an inconsistent oddity at best and a flamboyantly flagrant fiasco at worst, but parts of it sure are pretty. What's most frustrating about the movie is that its screenplay, adapted by Luhrmann and frequent collaborator Craig Pearce, is almost slavishly faithful to Fitzgerald's text. That means it could have been the basis for an excellent played-straight dramatization, instead of this cartoonish carnival ride. Aside from adding a framing device in which narrator Nick Carraway (Tobey Maguire) is recounting the story of mysterious millionaire Jay Gatsby (Leonardo DiCaprio) as a form of psychiatric therapy, and deleting the final-act arrival of Gatsby's father, the script contains nearly everything that's in the original novel, right down to moments as minor as Nick wiping a spot of shaving lather from a partygoer's cheek. The problem is that nearly every technically by-the-book moment of the movie is performed with tongue-in-cheek insincerity, silly histrionics, soapy earnestness or inappropriate slapstick that makes the production play like a vaudeville parody. Most of the cast could have been ideal for a non-winking interpretation of the material. DiCaprio would have been a fine choice to portray Gatsby's mixture of "old sport" magnetism, hidden menace and desperately romantic delusion. As the married object of his affection, Carey Mulligan probably could have toned down Daisy Buchanan's daytime-drama act a notch without much trouble. Likewise, Joel Edgerton (as Daisy's obnoxious and unfaithful husband Tom) may have been able to dial back his almost mustache-twirling villainy to more human proportions. Two supporting cast members who shine are Elizabeth Debicki as Daisy's longtime friend and flapper-fabulous golfer Jordan Baker, and Jason Clarke as beat-down and miserable George Wilson, the husband of Tom Buchanan's mistress. The weak links are Maguire, whose pop-eyed aw-shucks boyishness is all wrong for a character who is supposed to feel superior, resentful, disgusted and maybe a little envious of the fabulously wealthy "careless people" he comes to disdain, and Isla Fisher, who doesn't seem sufficiently hardened or demanding as Tom's vulgar mistress Myrtle Wilson. Director Luhrmann's decision to mix rap and contemporary pop music with less anachronistic songs on the soundtrack is a silly gimmick that's nearly as annoying as presenting the movie in utterly unnecessary 3-D. The subtle and evocative score by Craig Armstrong, however, may be the most enjoyably unaggravating aspect of this otherwise more-is-less affair. The film's gaudily glitzy production design, which has a lot in common with the look of Luhrmann's "Moulin Rouge! ", is undeniably dazzling. All of that rainbow-drenched garishness is very much at odds with what is basically a melancholy and downbeat tale of obsession, psychosis and "the rich are different" cruelty, however. And music-video-quick cuts and dissolves often make the film appear to be an extended trailer for itself. Similarly, Lurhmann's busy and sweeping camerawork sometimes seems less appropriate for a class-centric character-based melodrama than a Harry Potter film. Soaring back and forth between the Buchanan's green-lighted dock and Gatsby's Hogwarts-huge mansion feels like flying on an agitated dragon's back. When it comes to re-interpreting any classic, what one viewer sees as playfully creative irreverence may be regarded by another as blasphemous desecration. Even Luhrmann seems to realize he has gone too ostentatiously overboard when he pulls his flight of fancy closer to earth in its third act. Misbegotten but memorable, what starts out as an everything-flashier-than-everything-else spectacle wraps up with an ending that actually manages to be moving.